The experts agree—if you want to stick to your fitness plan, you need to find something you love to do. 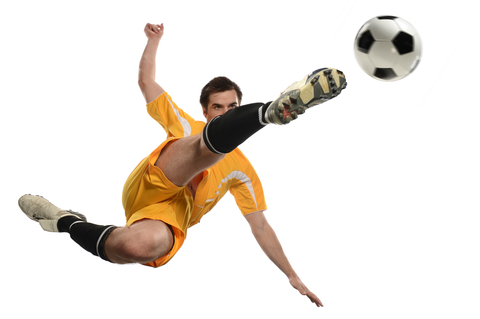 Soccer is a fantastic cross-training opportunity that has some mental benefits, too. If logging miles on the treadmill bores you to tears, hit the soccer field instead to work on your cardio. Hayes explains that soccer players can travel a distance of eight to 12 kilometres each game. “The aerobic fitness demands of soccer increase the ability of the heart to pump blood to the muscles and helps clear the build-up of plaque inside the arteries, which is a sign of cardiovascular disease,” he says. The benefits? You’ll enjoy a slower resting heart rate, a decrease in systolic blood pressure and a healthier working heart, Hayes says. Added bonus—you won’t get winded running up a couple flights of stairs. While you may think of your fitness goal as the one thing in your life that’s all about you, consider the idea that you can share that goal with others and take the lessons you learn on the field into the rest of your life. “The ability to work with others to reach a common goal is powerful when related to everyday life,” explains Hayes. “For soccer players, personal goals are sometimes pushed aside by team goals, which can teach people to think in broader terms when relating these situations to work and home.” That means you never have to feel selfish for taking that time out for yourself again.